The fourth in a very intermittent series of dopplegangers. Friends, the famous and more..
With murmours of the beginning of a slow implosion at Apple, I can now reveal the hidden past of Jony Ive, Apples senior vice president of industrial design. Those in the know say the real reason the Brit is considering a move back to the UK is not any disagreement with the Apple board, but to escape the ongoing rampages of his blood twin Jason Statham. Mr Statham is still furious that, thanks to a mix up in the antenatal ward all those years ago, Jony ended up with the name destined for Hollywood-lights, leaving the kick boxing film star as half leader half landing stage. Posted on March 11, 2011 by Andrew J Scott. This entry was posted in Separated At Birth! 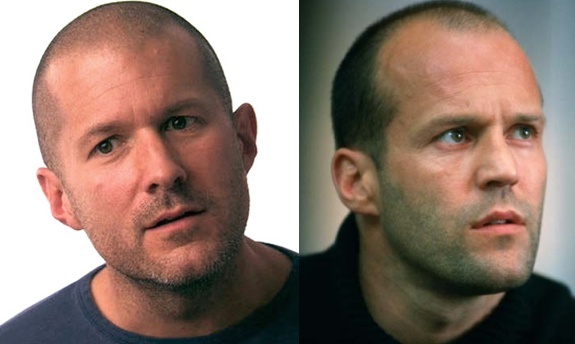 and tagged Apple, jason statham, jony ive, Separated At Birth!. Bookmark the permalink. Rumors are that Jony Ive is going to star in Guy Ritchie’s latest dreadful London mob film, iGangster.